ALMOST two tonnes of metal has been collected from the ashes of cremated bodies in Northern Ireland over the last four years as part of a recycling scheme, but bereaved families were not told, The Detail can reveal. Precious metals including jewellery, gold teeth and fillings, as well as metal hips and nails from coffins are routinely collected from the site of Northern Ireland’s only crematorium in a process that began in 2010. The materials are shipped to the Netherlands where a specialist company sorts the metals, with some being re-used in the construction of objects as diverse as road signs and aircraft engines. Industry guidelines recommend that bereaved families are made aware of the recycling scheme. 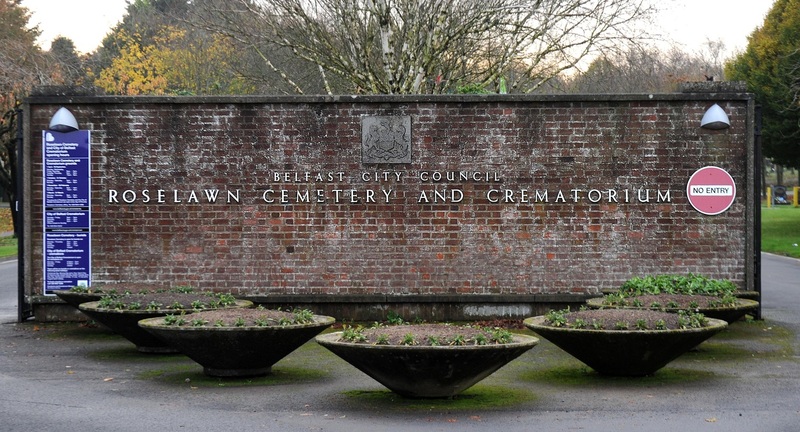 However, Belfast City Council, which is responsible for Roselawn Crematorium, said it has not notified bereaved families despite over 11,000 cremations taking place since the recycling scheme began. We asked the council if families of the deceased are made aware of what can happen to metal remaining after cremation. The scheme’s aim is to protect the environment by recycling the metals with profits going to charity. While The Detail first raised the issue of family consent in questions to the council two months ago, it has now said it is to be formally raised with elected members within weeks. There is no suggestion of illegal or untoward conduct by Belfast Council. It has been argued that families would prefer not to know about the practicalities of disposing of human remains, though the subject does raise complex ethical issues. Dr Heather Conway is a senior lecturer at Queen’s University’s School of Law and an expert on bodily disposal law and funeral disputes. She said although there was no suggestion that the council was acting unlawfully, she believes its failure to inform families of the recycling scheme over the last four years raises a number of concerns: “Because of the symbolic and emotional attachment that we have to our loved ones’ remains, this has the potential to be hugely upsetting for people. “Industry practice guidelines state that people should be informed and there are clear ethical issues if bereaved relatives are not made aware that their loved ones’ remains may be subject to this process." Meanwhile the National Association of Funeral Directors (NAFD) said it was not aware the scheme was operating in Belfast. It said the issue of family consent may now be raised at Stormont as part of an ongoing campaign to reform cremation forms in Northern Ireland. The Dutch company behind the recycling scheme, Orthometals, said that after processing costs are accounted for the remaining value of the metals collected is donated to charity, with the main aim being the promotion of recycling in the interests of environmental protection. There have been over 11,000 cremations in Northern Ireland between 2010 and 2013. Metals remaining after cremation are removed with tongs and a magnet and placed into a recycling container. Almost two tonnes of metal has been collected from Roselawn Crematorium since 2010. The metals include gold, silver and palladium but the vast majority originates from metal hips, as well as nails, screws and ornaments – such as crosses – from coffins. The recycling container is collected by Orthometals and taken to its sorting facility in the Netherlands where it is sorted and sold to foundries where it is melted. Orthometals said some material is sold for casting pieces in the aircraft, car and household industries. Once costs for processing have been accounted for, the remaining value of the metal is donated to charity. Over £30,000 worth of metal has been collected from Belfast and donated to charity. Crematoria are asked to select charities to be added to the list of beneficiaries, but Belfast City Council confirmed it had not selected a charity of its own to be added to the list. The infographic below has been designed by The Detail and provides an overview of how the recycling process has operated in Northern Ireland. There are currently 157 crematoria taking part in the recycling scheme across the UK. Before Belfast joined the scheme in 2010, any metals left over after cremation in Northern Ireland were placed in a general skip and disposed of by a local firm which held the contract. We asked Belfast City Council to explain how the metals are now collected under the recycling scheme. In a statement it said: “After cremation, the cremated remains are placed into a stainless steel receptacle. When the cremated remains have cooled, this stainless steel receptacle is placed into an ash transfer cabinet. 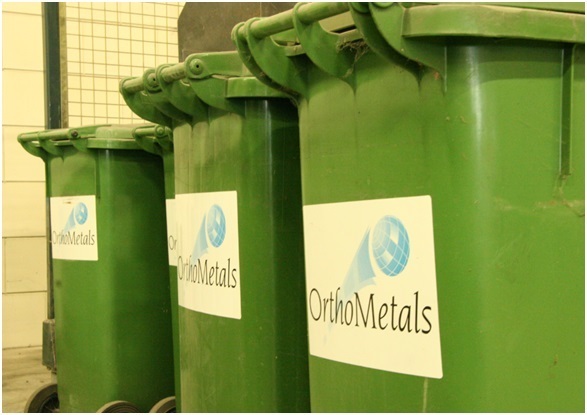 The Orthometals’ recycling scheme has been used in a number of European countries for almost a decade with the company stating that it collects 250 tonnes of metal on an annual basis from hundreds of crematoria across Europe. In the UK Orthometals travels to over 150 crematoria once a year to collect the metal. Orthometals is also in the possession of the permit to collect and transport waste in the Republic of Ireland. Orthometals confirmed that over the last four years it has collected almost two tonnes of metal from Roselawn Crematorium. 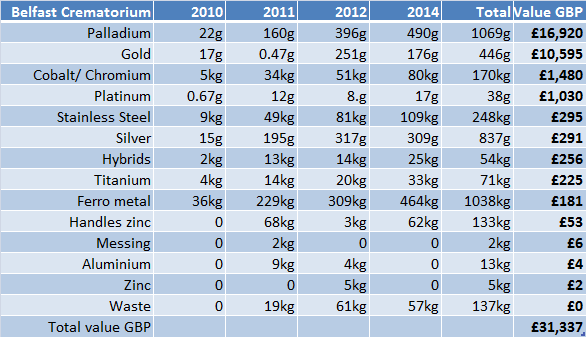 The table below outlines the weight and value of the metals collected from Roselawn since 2010. From the money received for the metals, Orthometals charged 20% for its services. This cost has been deducted from the figures below. According to Orthometals there is no data available for 2013 as there was not enough material to warrant collection. Palladium and gold are among the highest valued metals that remain after cremation. Palladium can come from dental implants, such as fillings, and the gold can originate from gold teeth or jewellery. The Institute for Cemetery and Crematorium Management (ICCM) promote the scheme on behalf of Orthometals in the UK. In response to questions from The Detail, the ICCM stressed that the entire remaining surplus made from the value of metals after processing costs is donated to charity. It said that since the scheme began across the UK, £1.7million has been awarded to 102 different charities up to September 2014. Every six months the ICCM writes to each scheme member requesting a nomination for a local death related charity. The number of nominations received is divided into the total surplus with each nominated charity receiving an equal share. Not all crematoria submit a nomination, but 75 of the 157 participants nominated a charity in the latest round of distribution. Belfast City Council confirmed it has not nominated a charity since joining the scheme in 2010. If a crematorium does not make a nomination it has therefore not put forward a charity to receive a donation, but the overall total of money raised is still divided among all the charities that have been nominated across the UK. Documentation published on the ICCM’s website shows that it received legal advice before adopting the scheme for use in the UK. The advice states: “Ownership of the implants and metals lies with the company/authority as there is no property in a dead body and on the basis of abandonment of metals by both the relatives of the deceased and the NHS. Guidelines published by ICCM since implementing the scheme in the UK state that relatives should be provided with information about the scheme to enable them to make a decision on whether they want the metal to be recycled or delivered to them with the cremated remains. The ICCM said its guidance on the need for consent is clearly laid out on its website where standard consent forms can be downloaded. On its website the ICCM provide a model press release for use by any crematorium participating in the scheme. It recommends to the public that they retain jewellery and not cremate it with the deceased. This model press release also indicates that a member authority will gain the consent of the applicant for cremation to recycle residual metal. Belfast Council said the issue of whether or not bereaved families would like to remove metal belongings from loved ones before cremation, including jewellery, is “a matter for advice from the individual funeral director to the family of the deceased”. However a spokesperson for the ICCM said that any crematorium participating in the recycling scheme should also explain the scheme to funeral directors so they can make the information about the recycling scheme available to their clients. The National Association of Funeral Directors (NAFD) represents around 80 funeral firms in Northern Ireland. It said the fact that the recycling scheme has been operating in Northern Ireland has not been raised with its members. A spokesperson said: "The National Association of Funeral Directors is aware of the recycling scheme operated by the ICCM, but has not been made aware of its operation in Belfast nor have NAFD members in Northern Ireland been requested by Belfast City Council to discuss the issue with bereaved families. “Funeral directors do, as a matter of course, however always discuss with families whether they wish to retain jewellery worn by the deceased prior to cremation as it is usually destroyed by the cremation process. Queen’s University expert, Dr Heather Conway, who is currently writing a book entitled ‘The Law and the Dead’, said the council should review its position. She said: “There is most certainly worth in the recycling scheme in terms of the environmental and charitable impact it has. However the fact that bereaved relatives aren’t informed that their loved ones’ remains are subject to this process raises concerns. “I do think the council needs to review their codes of practice in relation to their participation in this scheme to ensure that these comply with industry standards. At the very least this opens up a debate on something that wasn’t widely known, certainly in Northern Ireland, and I think it does need to be brought out into the open." For anyone who is affected by bereavement issues, the charity Cruse Bereavement Care can be contacted on the helpline 0844 477 9400 or at its website.